Girl Scout Traditions! Join Girl Scouts of all ages for a day of Girl Scout fun. 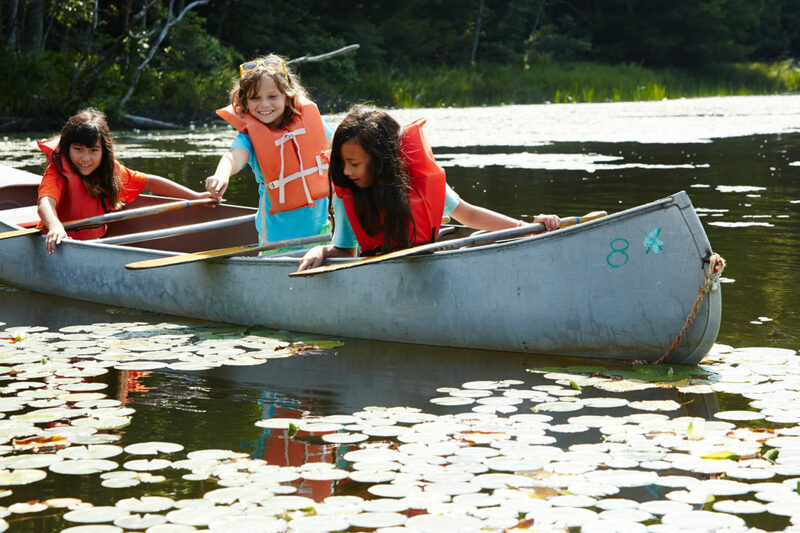 Participate in traditional Girl Scout activities while you earn the Girl Scout Way badge. We have two events: Girl Scout Way Badge Day, September 17, 2016 at Camp Libbey (Defiance, OH), $5/girl and $5/adult, or Girl Scout Traditions, October 22, 2016 at Camp Whip Poor Will (Morrow, OH), $8/girl. Canoe Float Trip! CSAs enjoy the scenic Blanchard River as they paddle upstream on September 24, 2016. Work on basic canoeing skills, and learn about safety, getting in and out of the canoe, paddle strokes, and more, $12/person. Not quite ready for a float trip? Juniors and Cadettes can gain confidence on the water with Intro to Canoeing on September 10, 2016. They’ll develop basic canoeing skills with a certified instructor, learn about safety, getting in and out of the canoe, paddle strokes, and, weather permitting, learn how to tip a canoe and get back in, $10/person. Both events take place at Riverside Park (Findlay, OH). Not near you? Check our Program Event Guide next fall for other canoeing events across Western Ohio. Legacy Athlete Badge Overnight! Athletes work hard, and play hard! Brownies and up spend a fun-packed night running, playing and earning their Athlete badge until they run out of energy and take to indoor “camp”! November 11-12, 2016, at Rialto Sports (West Chester, OH), $18/person. Amazing Polar Race! Juniors and up test your troop’s outdoor skills in this ultimate cold weather contest on December 10, 2016 at Camp Whip Poor Will (Morrow, OH). Compete against other troops, racing across camp and completing challenges on topics ranging from first aid, lashing, orienteering, team building, and much more. Your troop will receive a map with an assigned route to stations that must be completed in a specific order. Each station will be judged and points awarded based on how well tasks are completed as well as aspects of leadership, teamwork, and Girl Scout spirit, $8/person. Roman Catholic Faith Events! Join girls from across the Diocese of Toledo to earn their age level’s Roman Catholic Faith Award: Mary, the First Disciple Award (9th-12th grade), I live My Faith Award (4th-6th grade), or Family of God Award (2nd-3rd grade). Learn more about faith and how to live it out through discussion, crafts, and activities led by adults from the Catholic faith. Attend the I Live My Faith/Family of God event on September 24, 2016, $20/girl, hosted by St. Michael the Archangel School (Findlay, OH) or the Marian Medal Retreat on September 17-18, 2016 hosted by St. Patricks’s of Heatherdowns Church, (Maumee OH), cost $25/girl. Not your diocese? The Archdiocese of Cincinnati will be partnering with us for our 3rd annual Fanning Faith’s Eternal Flame event to recognize girls who’ve earned their My Promise, My Faith pin or religious recognitions in spring 2017. Look for more information on that event in our Program Event Guide coming fall 2016. Not Catholic? Check out Praypub.org for other faith recognitions and emblems that your Girl Scout can earn. Boats, Ropes, and Bows! Juniors and up learn the secrets to besting some of the most challenging areas at camp, and become a master of archery, canoeing, and the climbing wall! Learn the basics, and then it’s time to challenge girls and their teams through archery games, rescuing a swamped canoe, and conquering the wall blind folded. We have two sessions of fun at Camp Whip Poor Will (Morrow, OH) September 3, 2016, $10/girl and $5/adult, so don’t miss out! Camp Libbey Walk-About! Girls of all ages will enjoy this “walk-about”, a fun, non-competitive walk as they discover some of the lesser known trails at Camp Libbey (Defiance, OH) on October 29, 2016. Choose a guided walk with your troop or family or explore the well-marked trails on your own, $3/person. Mother Daughter Day! Grab that special gal in your life–your mom or another female adult role model–and enjoy a fun, adventure-filled day at Camp Woodhaven (Lima, OH) on September 17, 2016. Spend the day fishing in the pond, creating a fingerprint family portrait, building a marshmallow catapult, and much more, $10/person. Older girls (CSA) and their gals will enjoy additional age appropriate adventures, like the high challenge course. 24 Hour Experience! Seniors and Ambassadors have fun, laugh, and make long-time friends as they engage in recreation, outdoor skills, group challenges, night experiences, and environmental activities over a 24-hour period September 17-18, 2016 at Camp Whip Poor Will (Morrow, OH). Girls will travel with a group along a variety of terrains and trails, and engage in a full range of activities and tasks that will expand their confidence, and improve leadership skills, environmental awareness, group cooperation, and practical living skills, while occasionally cat napping along the way, $15/girl. Journey Jumpstarts! Brownies and Juniors join with Toledo Grows for some It’s Your Planet, Love It! Journey fun October 15, 2016, $10/girl. Brownies will explore the Wonders of Water at the rain garden as they learn about the water cycle, rain gardens, and rain barrels, while working towards their “Love Water” Journey Award. Juniors will Get Moving at the farm as they see how plants use energy at the greenhouse, and observe how animals on the farm communicate and use energy, while working toward their “Energize” Journey Award. Need a different date or location? You can also join us December 3, 2016 at the Dayton Service Center for Journey Jumpstarts: Get Moving for Juniors and Breathe for Cadettes, cost $10/girl. Journey Retreats! CSAs join us for a weekend of Journey fun November 18-20, 2016. Cadettes can get a jump on the aMAZE Journey, and spend the weekend at Camp Whip Poor Will (Morrow, OH) in a maze of friendship, discovering how to create peace together and earning the Peacemaker and Interact Awards, $45/person. Seniors and Ambassadors dive into the issues girls face in our world and help decide what we can do about it at Camp Rolling Hills (Pleasant Hill, OH). They’ll complete the Discover and Connect portions of the It’s your World, Change it: GirlTopia and Your Voice Your World Journeys, $45/girl and $20/adult. These retreats are an excellent precursor to Girl Scout Highest Awards. These are just a small taste of the many wonderful and sometimes wacky program events that are available this fall. Further information about all of the program events we offer can be found in the Program Event Guide available at fall kick-off events and at fall Service Unit meetings and posted online at GSWO Events in a list and calendar format. Don’t miss out, registration for fall events opens on June 1, 2016. Then don’t forget to mark your calendar for November 2016 when registration opens for winter and spring program events.